Add the Russell’s Reserve, Calisaya, Fernet-Branca, sweet vermouth and bittermens bitters to a chilled mixing glass. Add a cube or two of ice and stir ever so briefly (not trying to totally chill this one). Strain into a chilled rocks glass over a large cube. Peat whiskey and citrus with just a hint of tobacco and clove. Upfront you get a very smooth whiskey and citrus flavor with accents of herbs from the Fernet. The vermouth helps to smooth everything out, especially one like Cocchi Vermouth di Torino. Just before the finish, there is a crescendoing complexity with mint, citrus, herbs, quinine, leather, burnt sugar and tobacco. The finish dries out some with light notes of clove, cinnamon, mint and tobacco, that while seemingly heavy at first, lightens up and leaves you ready for another taste. This one stems from wanting to use a higher proof whiskey in a cocktail that both highlights the stronger flavor, but doesn’t end up tasting like straight booze. Upon trying the excellent Russell’s Reserve Single Barrel, for some reason two spirits came to mind: Fernet-Branca and Calisaya. No surprise on the Fernet, it pretty much makes everything better, adding herbal bitter and mint-like accents to any beverage. Meanwhile Calisaya is a great preprohibition liqueur that for a long time was extinct, but has recently been revived thanks to some great folks in Oregon. Notes of quinine and orange, I know you are thinking Campari, but this one is considerably sweeter (remember it’s a Liqueur after all). Anyway, Calisaya also seemed like a perfect choice to both sweeten up the strong bourbon, and also provide accents of bitter and orange (two flavors I enjoy in case you couldn’t tell). After a bit of playing around, we end up with something in between two of my favorite cocktails, the boulevardier and the Old Fashioned. The peated scotch rinse (I prefer Peat Monster from Compass Box), really adds a great smoked flavor, while the flamed orange peel provides burnt citrus taste that pairs perfectly with this drink. The name in a sense has two meanings, one being that this was a “study” of my own to find a great drink that would showcase a higher proof whiskey, while still taste smooth and delicious. It also incidentally tastes like a great drink to have in a study. If you like the Old Fashioned, Boulevardier, or Fanciulli, you owe it to yourself to spend some time with The Study. You could use another higher proof whiskey in this one easily but Russell’s Reserve has a great flavor in this one. 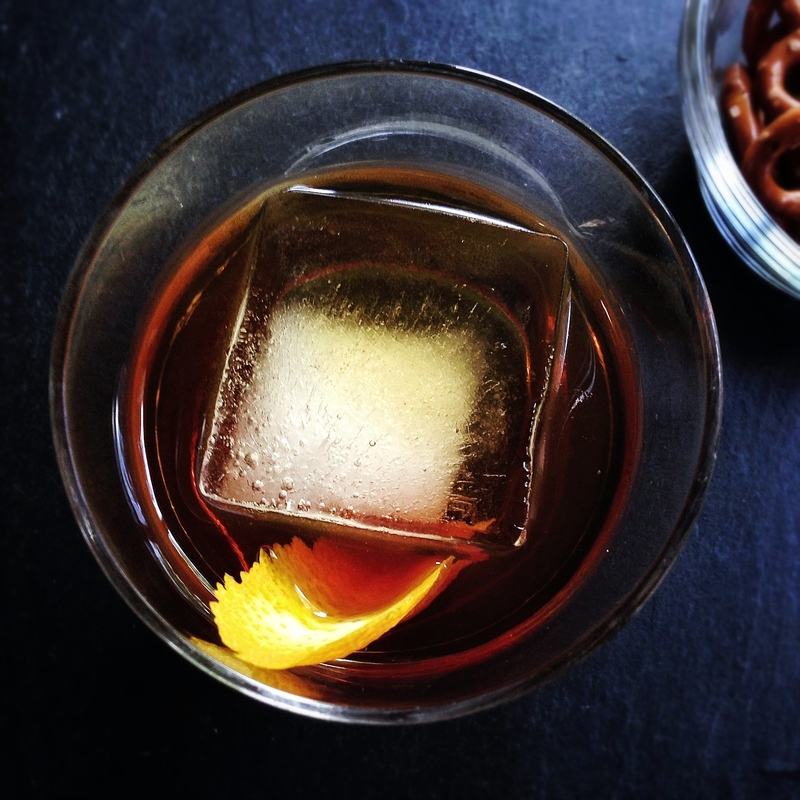 Alternatively try: OLD FASHIONED, BOULEVARDIER, or FANCIULLI.